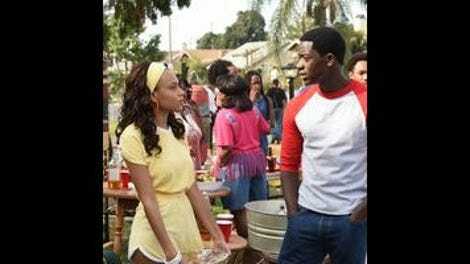 This week’s episode of Snowfall, “seven-four,” boasts quite the intriguing cold open. For the second straight week the show kicks off by establishing an eerie, mysterious atmosphere. Where last week it was the chilly aftermath of a brutal killing, this week it’s Teddy and Alejandro stranded in the Mexican desert. Their two-seater plane sits on a pile of rocks while Teddy tries to tinker with everything on the underside; all while Alejandro lays in the shade. It’s no beach vacation though, as Alejandro’s unconscious, the bandage wrapped around his head starting to sport pools of blood. Just like last week, the cold open brings a lot of questions to the table: what happened on the landing? Why did Teddy freak out and change the plan? How long have they been there? Intriguing questions for sure, but the problem is, Snowfall doesn’t seem all that interested in offering up any answers. Snowfall‘s biggest problem at the season’s halfway point is that it’s spread too thin. In the early episodes, and especially in the rather stunning season premiere, the sprawl of the story seemed to be the show’s greatest asset. If you’re going to tackle the rise of crack cocaine in the U.S. as more than just plot, and really attempt to portray some of the politics behind it all, your show requires a grand scope. The series premiere felt alive, as characters came and went and a general atmosphere, one of joy and yet impending doom, took hold. Now, Snowfall is struggling to use all of its pieces in a meaningful way. The narrative is getting lost, and that’s because there doesn’t seem to be much focus on how to pace the story, or rather stories, across 10 episodes. The pacing issues are most evident in Teddy and Alejandro’s storyline. In a mere four episodes we’ve seen Teddy force himself into a new gig after a timely drug overdose, snag a bunch of U.S. government weapons for anti-communist fighters in Latin America, travel to the jungle to meet with said forces, and reconnect and then disconnect from his wife and son. That’s a lot of ground to cover in four episodes, and it’s robbing the story of any potential impact. It’s hard to care about the plight of Alejandro and Teddy in “seven-four,” despite the dire circumstances, and that’s because Snowfall hasn’t given us much to connect with. The goals and motivations of both men are unclear, so stranding them in a desert doesn’t feel like any sort of moment of tension and unpredictability, bur rather a dull bit of narrative contrivance that fails to create any conflict or intrigue. Similarly, pacing issues rear their head in Gustavo’s story. This week he’s at a Fourth of July party at the behest of Pedro. Really, Gustavo’s presence is a way for Pedro to try and get the heat off of him and Lucia, attempting to show his father Ramiro that everything is under control, and that they have a man they can trust. It makes sense that Gustavo would eventually have to be introduced to the family, but once again, the show doesn’t seem to know how to make the moment feel meaningful. Gustavo just sits in a room with Ramiro, answers two questions, and then tells Lucia that he’s determined to become an equal partner because he’s killed two men for their cause. This is Snowfall rehashing character insights that have already been established; just like Teddy and Alejandro’s desert escapade does nothing except stall the narrative, so too does this Fourth of July party only underscore how quickly Snowfall is becoming stagnant. As is becoming the case each and every week, even when counting the meandering quality of “Trauma,” Franklin’s story provides something more substantial. For his Fourth Of July, Franklin bails his father out of prison, which leads to him showing up at Jerome’s party, provoking tension between Cissy and her ex-husband (presumably, though I’m not sure that the specifics of their relationship has been made clear), as well as between Franklin and his mother. Everything boils over when a couple of white cops show up and try to break down the party, putting Franklin in a chokehold and nearly killing him before a black officer intervenes. It’s an uncomfortable scene that evokes the death of Eric Garner, caught on film, and yet Snowfall isn’t quite sure what to do with it. The show is clearly attempting to explore how our current political climate is a direct result of oppressive policies and systems that were refined in the 1980s (and in play well before that), but there’s no real punch behind the comparisons. Again, Snowfall could use a little clarity, which is perhaps impossible considering how many storylines the show is juggling at once. The idea, I suppose, is that this run-in with racially motivated authority, coupled with the criticism of his father, sends Franklin back to Avi, back to a life where he can “become his own man.” Just like last week’s sudden departure from the game though, it’s all so rushed, and the result is a storyline that has all the potential to be dramatically entertaining and culturally biting and relevant, but hasn’t hit those heights yet. Based on a lot of the comments I’ve seen on these reviews so far, I’m going to venture a guess and say that many of you were not too happy to have a third of an episode dedicated to Teddy talking to himself. I know I wasn’t. When Cissy is worried about her son getting a job and staying on the right path, he responds simply: “I’ma see to it.” Cissy’s uncertain look says that she’s perhaps heard that line from a man in her life before. One plot thread that’s just continually dangling is Franklin’s affection for Melody. What looked like a romance angle, and then a betrayal angle, is seemingly a whole lot of nothing at this point. “seven-four” allows Alejandro to be knocked out for the entirety of the episode, and who knows how long within the show’s timeline, only to have him simply wake up and fly the plane away. While “seven-four” may be the most sluggish episode of Snowfall so far, I’m never going to argue with an episode of TV closing out with Funkadelic’s “Can You Get To That?”, an all-time classic that also happened to contribute to the only good song Sleigh Bells ever recorded.